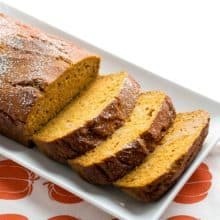 Delicious pumpkin bread that uses half oil and half apple sauce. This is one of those recipes you definitely need in your recipe box! Kick the tires and light the fires to 350 degrees. Grease two standard loaf pans and set aside. Mix your eggs, pumpkin, oil and applesauce in a large mixing bowl. In another smaller bowl, whisk together all your dry ingredients. Add the wet to the dry, and try not to over mix, because we are baking with persnickety pumpkin, after all, and nothing gets tougher when over mixed than pumpkin does. Mix everything together until just combined. If wanted, you may add nuts an raisins at this point. Divide the batter between the two prepared pans. Tap the pans gently on the counter to release any air bubbles. Bake in the oven for 55-65 minutes or until a cake tester or knife inserted comes out clean. Remove and cool for 10 minutes then remove the loaves from the pan. Cool completely then store in an airtight container or wrap in plastic wrap to keep fresh.